As well as making the children’s learning creative, visual and fun, an Arty Party Workshop is a unique experience for your school. We can help transform a gloomy playground, dull reception area and any uninspired corridors or stairwells. All of our School Workshops are bespoke and we can cover any area of the curriculum or make artwork to fill a particular area. Creating 3D Sculptures, Mosaics, Silk paintings, Murals, Canvases, Pictures in Relief or indeed individual projects - the children are involved in every part of the process! We are happy to come in for Art weeks working with whole classes to produce individual pieces or with small groups working on much larger collaborative projects. £375 per day (plus materials) This is with 2 artists working with up to 60 children per day from Years 1 – 6. "Children are captivated and proud of the art work they have created with the artists in school. 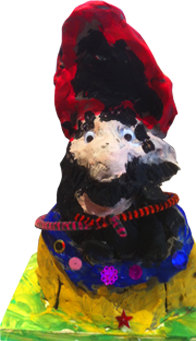 Arty Party encourage children to work collaboratively, using a wide range of new exciting skills, to create an exceptional final outcome – one that is admired by all parents and visitors to our school. Thank you!" "Arty Party have made an amazing dragon and led us in such a fabulous project! The children and staff have loved working with them and having them in school. Their enthusiasm and passion shone through their work and made this such an exciting project that everyone was enchanted to be involved in. We are so delighted with their work."